The background: French niche line Comptoir Sud Pacifique released Vanille Banane in 2003. At that time, the brand had a bit of a cult following for their various vanilla + fruit blends, none of which I cared for (although I still wear two early Comptoir Sud Pacifique fragrances, Aqua Motu and L'Eau du Gouverneur). I doubt I even tried Vanille Banane. In due course it was discontinued, then in 2018 they brought it back. What the brand says: "Renowned for pristine beaches and lush tropical scenery. Walk among the Banana trees, delighting by the gourmand scents of banana fruits combined with the green notes of the banana leaves. An unforgettable fragrance intensely exotic, a greedy fruity cocktail with Vanilla and Rum." The notes include orange, banana, whipped cream, banana tree leaves, clover, vanilla and white rum. Why I bought it: I've mentioned before that 2018 was not a good year for me. I did not succumb to an entire year of stress buying, but I did bookend the year with stress buying. First, in January, a spur-of-the-moment purchase of Atelier Cologne Iris Rebelle. Then in December, I succumbed to a long-time, spendy-for-me lemming for Aftelier Candide. While I was at it, I was buying some other things for the holidays (you know how that goes) and I had a 20% off coupon (ditto) so I thought, banana, why not? How bad could it be? What it smells like: The opening smells like banana candy + banana pudding + a touch of cream soda. 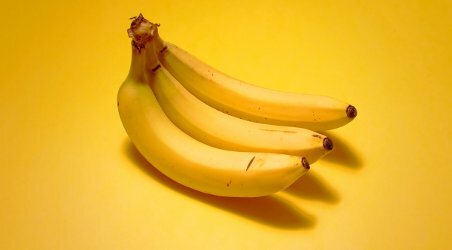 So, think banana flavoring, not the freshly peeled fruit — if there was some intention of verisimilitude here, the inspiration must have been laffy taffy or banana runts, both of which you'll find frequently mentioned in reviews of Vanille Banane. After a minute or two, add a dollop of coconut cream and a splash of rum (personally, I could do with another splash). The banana hangs around for a good 30 minutes or so before fading gradually. What is left is pretty much the vanilla, which is adequate, but no Guerlain Spiritueuse Double Vanille. If you love Comptoir Sud Pacifique Vanille Extreme or Vanille Coco, you might love the dry down more than I do. The lasting power: There are lots of complaints about the lasting power. I wish the banana lingered a little longer, but otherwise I have no complaints — the vanilla lingers 2-3 hours after the banana is gone, which is long enough for me. Verdict: You will either think it's all great fun, or you'll think it's ridiculous as a personal fragrance. Quite possibly, six or seven years ago, I would have fallen into the "you've got to be kidding" camp. At the moment, I find it serves its purpose admirably — every time I spray it on, I smile. It's cheaper than Xanax, folks! 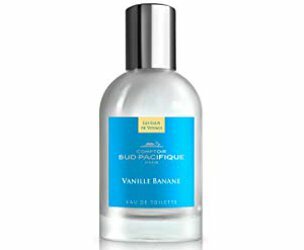 If you need some: Comptoir Sud Pacifique Vanille Banane can be found in 10 ($24, and possibly out of stock everywhere), 30 ($42) and 100 ($85) ml Eau de Toilette. The quick poll: Name a fragrance that makes you smile when you're stressed or unhappy, but that you probably wouldn't wear otherwise. Note: top image is Los tres plátanos  [cropped] by Rick Harris at flickr; some rights reserved. I have and LOVE Vanille Abricot,such a sunny and happy fragrance! The fragrance that always makes me smile is Madame Rochas.Only because it was my Mom’s favorite.I will never wear it myself,but it is so bound to memories of her that of course it makes me smile and relive some really great memories. You know, I am sure I did not love that but I should really try it again, and ditto for Amour de Coco — in fact if I could find the latter in 10 ml, I’d probably just buy it. Vanille Abricot is joyous. It always makes me happy. It doesn’t really count for this poll because I wear it all the time. I have a whole bunch of CSPs and they’re all uncomplicated scents that put me in a good mood. Vanilla plus apricot, orange, pineapple, peach, cinnamon, amber, chocolate, coffee…how can you go wrong? I LOVE Vanille Abricot too! and Middle Marzipan stole my bottle-LOL! Did she at least let you get a decant of it? I did not do it fast enough-LOL! It’s OK . I don’t mind sharing. Thanks for the review, Robin! I have an untested sample of this sitting around somewhere, I’ll try to remember to break it out next time I need a quick smile. Your comparison to banana laffy taffy reminds me of my answer to your poll question: a few years ago I picked up a perfume oil called Mountain Mama from a small boutique in Seward, Alaska. We were on a weekend trip there and I had forgotten to pack any other fragrance, and I liked the graphic on the front of a grizzly bear surrounded by flowers. What the sign called a “bouquet of wildflowers” smells to me like that synethetically fruity zebra stripe gum. Like laffy taffy, it feels nostalgic and cheerful to me. I find myself opening it to sniff more often than I find myself actually wearing it. It’s even more fun when it’s supposed to smell like wildflowers, I think! I’m a gourmand fan and own plenty of CSP, my fave is vanille coco which I use often for layering. I test drove the vanille banane as well as Hilde Soliani’s Donna Sentenza, and unfortunately neither hit the mark for me as far as the banana note, felt like it came on a little too strong then just disappeared. When I need comfort, I hit up the sweet vanilla scents. FSSA Cara is a favorite. It may be that there is no long lasting banana scent! But I should try the Hilde Soliani, although it’s way out of my “just for fun” price range. CdG Carnation reminds me of the Avon carnation scent I had as a child. It’s a bedtime scent and not worn during the day, as it doesn’t last too long. That was a really nice scent…can’t remember now if they are still making it? Glamour Yeti is also the perfect name for a cheer-me-up fragrance. Dali Laguna. I reserve it for summer weekends and holidays only, never work days, so as to keep up the happy associations. We are at the beach right now and I’ve worn it every day this week. I definitely wear Minotaure in large part because of the joke I perceive in it, which is a hint of barnyard/manure. Interesting … and ties in with the comment about Angel just below. I rarely wear Angel (because my husband HATES it), but when I do it always makes me smile. There’s something so . . . obnoxious about it that cheers me right up. Hahaha yeah I get that! The first time I ever smelled Angel I laughed out loud because it was so preposterous. I hardly ever wear it because it’s just too much, but I have a few minis just in case I’m ever in that kind of mood. I have the leather Angel and also the Liqueur de Parfum 2013 because they’re miles beyond the original — much more grown-up and less, as you put it, obnoxious. That would have to be Ananas Fizz. I have the big bottle in the bathroom and it’s such an umbrella drink happy smell. I spray it on my ribbon hair bands, housecoat, towel and anything that hangs on a hook. Don’t forget the long-lasting banana (and jasmine) in blackbird Y06-S…both make me smile. Ah, but I did forget it! Ok, must find sample. There’s very little that I would not wear. and all my favorites make me smile. Perhaps Pink Sugar might fit this survey? Perfect way to look at it! Kiss Me Tender, which I can’t spray on without saying, “I smell like cookies!! !” I don’t usually love wearing sweet perfumes, but it smells SO much like almond sugar cookies on my skin that I really get a kick out of it, and am *gasp* nearing the end of my bottle. Such a good one! Kiss Me Intense is not nearly as emotionally uplifting, I think. I hate bananas so this one is definitely not for me, lol, in any circumstances. But I too like the Vanille Apricot from this line. Re: the poll question, Demeter Gingerale is really fun and is great in lieu of a morning coffee to keep me awake and alert! Unfortunately it’s lacking in lasting power, and maybe not appropriate for work use. I hate bananas and Xanax is actually pretty cheap, BUT Dilettante makes me smile every time, as does Bombay Bling. They both cost more than Xanax though. Bubblegum Chic. Convertibles, pink cashmere and sunshine. Ridiculous but perfect when you need it. Vanille Banane is a lower rent version…no convertibles or cashmere here! Arielle Shoshonna always makes me smile, but I wear it–it’s definitely not a guilty pleasure for me. This is going to sound very silly and ridiculous, but Johnson’s baby cologne is something that I never ever wear (it is for babies anyway), but the smell of it when I am super stress is better than Xanax. I have kept a small bottle for many years and the smell is intact. Oh, interesting….and I did not even know there was a Johnson’s baby cologne! But assume it is close to the smell of the powder. PdN Vanille Tonka makes me smile! It’s the lime, I think. PdN does such great things with citrus. Reminiscence Patchouli always reminds me of happy times. I really liked the Elixir version. Wish they had better US distribution. I still have a couple CSPs that I haven’t let go of – Vanille Pineapple and Vanille Pitahaya. I don’t reach for them often, but sometimes they hit the spot. But a perfume that really makes me smile is Laura Mercier Tarte Au Citron. It smells like the best lemon tart, and I never seem to get sick of wearing it. I don’t know if they still make those 2, but I will look for them in Sephora! My choice has to be Vamp à New York, it never fails to make me smile, but I also wear it when I don’t strictly need a pick me up. Another great mood lifter is Paris YSL.